Why Would Our Govt (Sis Janet Napolitano), DHS, etc., Rush To Deport A Saudi National Connected To The Boston Marathon Bombings Who They’d Just Tagged as A Terrorist? Inquiring minds want to know. But there’s a big campaign of dis-information and deflection from the media and the government about what is really going on. Representatives, Michael T. McCaul, Jeff Duncan, Peter King and Candice Miller have requested a classified briefing on the Saudi national and the deportation order. Thank goodness someone is paying attention! But they need our help! Use this link, call your Congressmen/women and ask why in the world would the government first, take into custody a Saudi national, Abdul Rahman Ali Alharbi on Monday, Tuesday tag this dik-wad a “212 3B” labeling him a terrorist -a really bad-apple. Then later the same day, after Secretary of State John Kerry meets with the Saudi Foreign Minister Saud -bingo, all of a sudden the FBI is back-tracking. Subject dik-wad went from ‘suspect, to person of interest, to witness, to victim, to nobody’ and now they’re deporting him -unless somebody stops them! He just happened to be at the marathon at the time of the bombings, was naturally running away from the blasts and happened to be injured. All this occurred after not one, but two apparently “unscheduled” meetings with the Saudi Foreign Minister. Who is he and why are they trying to get him out of the country as quick as possible? We do know he was here on a student visa supposed to be attending school in Ohio, but had an apartment in Boston. Hum? Sound familiar? Were there 3 people working together planning the death and mayhem at the Boston marathon? If you don’t hear from me in a week or so, it may be because of my Open letter to John Boehner, Speaker of the House, sent recently. Well, maybe it’s because of the love note scribed on the outside of the envelope more than the letter itself. Please feel free to plagiarize me! When are the Republican Party and Congress going to stand up to this president??? Every time I open the newspaper or look at the news online he’s done something else totally outside the law and unprecedented. The latest of many is the “deferred action to process illegal immigrants” (Janet Napolitano’s words). Call it what you like, it’s backdoor amnesty for 800,000 illegal aliens. How is this going to produce jobs for Americans? You should also be screaming for Eric Holder’s resignation over Fast & Furious. You should insist on a special prosecutor to investigate White House security leaks. Not a dime more should go to Pakistan until Dr. Shakil Afridi is released and his family protected from further prosecution. We expect you to uphold the law and force Congress to do so. You want the independent vote, then get busy and earn it. And one more thing. Don’t send me a letter in reply on your fancy stationary. I am not impressed by that. Just do what the American people expect you to do. Sound like Nazi Germany? No, it’s the latest brainchild of the Dept. of Homeland Security. 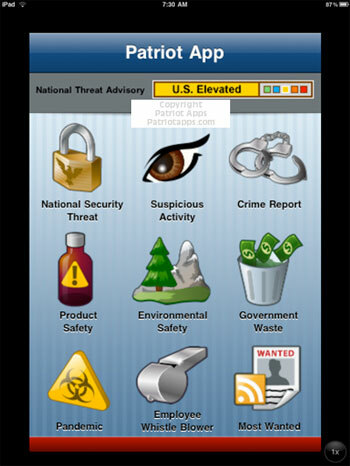 And like so many misnomers of government creation this one is called Patriot App. I wonder if it’s free or you have to pay Homeland Security to rat out someone? This coupled with the ‘If you see something, say something campaign‘ Wal-Mart is doing in cahoots with Janet Napolitano is guaranteed to keep us safe. It seems sorta creepy to me having Big Sis looking down on us What say you? Meanwhile Chicago, even after the Supreme Court overturned the city’s handgun ban continues to clamp down on gun owner rights. First they made it harder (increased paperwork and more expensive) to register guns, then they limit gun sales in the city and now they are making more difficult to use shooting ranges. Something’s not right here. In case you think I was a little over the top in my criticism of TSA, did you know TSA personnel are exempt from the screening you and I are subject to when travel by air? Check out these few high-lighted cases in this YT clip if you think I’m out in left field here. So I’m thinking I should wear a burqa on my next trip. It’ll save me having to pay for a blanket on board and make the security check in a little smoother too. A cursory look on Craigslist Hawaii was a dead end, but I found the traditional Afghan style burqa on both ebay and Amazon. Shop now and avoid the holiday rush!